Marie-Geneviève-Charlotte Thiroux d’Arconville, an anatomist, studied at the Jardin du Roi, the royal Parisian botanical garden (now known as the Jardin des Plantes), which also maintained a school for the sciences. In 1759, she translated and supervised the illustrations for a French version of Scottish anatomist Alexander Munro’s The Anatomy of Human Bones (1726). 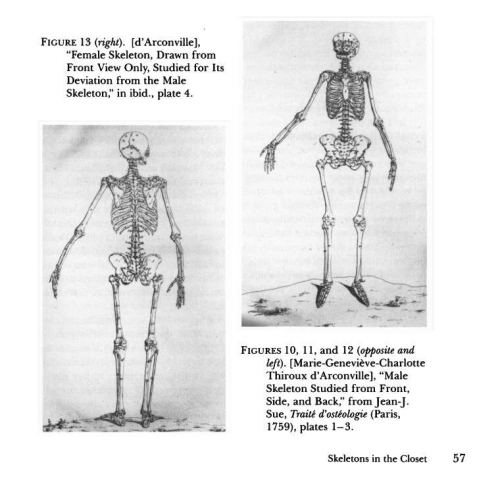 Her version, titled Traité d’ostéologie, included renderings of the female skeleton showing different proportions than the male skeleton. Although the drawings—later proven incorrect—were attributed to a man at the time, she is now credited with the works, which were the subject of scientific interest for many years.